The “Chinese wall” defence allows companies to avoid liability for insider trading which might otherwise be attributed from provisions of the Corporations Act 2001 (Cth) which deem a company to possess certain knowledge or information known to its officers. In Australia, the Chinese wall defence to insider trading has received little judicial attention, having only been considered in the case of Australian Securities and Investment Commission v Citigroup Global Markets (Australia) Pty Ltd (2007) 160 FCR 35. Whilst the aim of the prohibition on insider trading is to preserve market integrity, efficiency and investor confidence, this article will argue that the Chinese wall defence is too vague, uncertain and untested to provide sufficient clarity for these purposes. Further, this article will propose that additional regulatory guidance be given in respect of the requirements for an effective Chinese wall, so that appropriate legal protections can be provided, and to achieve the legislative aims and intentions underlying the prohibition on insider trading. In order to determine whether a transaction is regulated by the Personal Property Securities Act 2009 (Cth) one has to first determine whether a security interest that falls within the reach of the Act exists. The Act adopts a functional approach to what constitutes security and the reasons for this are well known. However, many transactions function as security and it is not the intention of the Act to capture every such transaction. The Act seeks to limit its reach by requiring the relevant transaction to provide for an “interest in personal property” as security for payment or performance. What constitutes this “interest in personal property” has been the subject of much debate. This article explores that concept and seeks to derive a working definition of “security interest” that can be used to predict whether a transaction falls within the reach of the Act. The standard of proof required in merger cases has become the centre of considerable controversies and confusion following the Federal Court’s and Full Federal Court’s decisions in Metcash. This article reviews the use of counterfactuals and the inherent contradictions in adopting the real chance standard of proof. It also critically examines the different approaches of the judgments in Metcash, and the more formal approach by the New Zealand High Court in the Warehouse decision. This is assessed using probability theory. The discussion points to the adoption of the balance of probabilities as the requisite standard of proof, and a watering down of the counterfactual in preference to a more direct approach to merger assessments. The United Kingdom’s Cameron Government embraces “The Big Society” – a legal strategy that reduces provision of services by the public sector (what Prime Minister David Cameron calls “Big Government”) and seeks to have services (ranging from education through to health care) delivered at a localised level. Such localised service provision places greater importance on the role of procurement policies and the operation of co-operatives and social enterprises. The idea is a dramatic expansion of the notion of choice and competition of the former Blair Government. Significantly for Australia, the Hon Tony Abbott MP (without using the British term “Big Society”) has flagged similar changes for this country (should he win office). But the fact choice and competition in some form has been embraced by successive British Governments means these issues have legal significance for Australia beyond the political cycle. This article examines what is “The Big Society”; and argues that should Australia adopt such, we would need to strengthen our procurement laws and policies and better understand the behaviour of co-operatives. The article examines particular difficulties that have arisen in implementing the Big Society in Great Britain, along with recent Australian procurements – the Building the Education Revolution Task Force Report and the pink batts scheme. Through that analysis it is concluded that: Australia needs procurement laws and policies that promote social value; that the government needs to maintain a strong role through a procurement champion or strong public works administration – and that the special public nature of government work must be promoted through the internal governance of co-operatives and through an overarching system of government regulation that makes those co-operatives accountable. 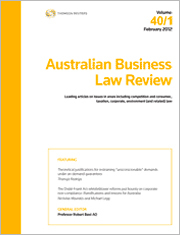 For the pdf version of the table of contents, click here: ABLR Vol 40 Pt 4 Contents.